This article discusses the differential diagnosis of metabolic acidosis and presents a scheme for identifying the underlying cause of acidosis by using laboratory tests that are available in the emergency department. Clinical strategies for treating metabolic acidosis are also reviewed. There are 3 approaches to understanding acid/base balance: A qualitative approach using the Henderson/Hasselbalch equation, a semiqualitative approach with base excess, and the Strong Ion Theory. The 3 theories are reviewed below. The Henderson-Hasselbalch equation describes the relationship between blood pH and the components of the H2 CO3 buffering system. This qualitative description of acid/base physiology allows the metabolic component to be separated from the respiratory components of acid/base balance. Bicarbonate (HCO3) is in equilibrium with the metabolic components. Unfortunately, the Henderson/Hasselbalch equation is not linear; pCO2 adjusts pH as part of the normal respiratory compensation for acid/base derangements. This nonlinearity of Henderson-Hasselbalch prevents this equation from quantifying the exact amount of bicarbonate deficit in a metabolic acidosis. This observation led to the development of a semiquantitative approach, base excess (BE). These classical descriptions of acid/base physiology often failed to account for acid/base findings in critically ill patients. An alkalosis was often noted in critically ill patients as their serum albumin level decreased, which could not be quantified by Henderson Hasselbalch or BE. Also, the "dilutional" acidosis frequently encountered after a large infusion of normal saline could not be explained by either of these 2 approaches to acid/base balance. Strong ion difference (SID) – Ions almost completely dissociated at physiologic pH. The Henderson Hasselbalch equation can be reformulated with variables from the Strong Ion Theory to give a more generalizeable solution to pH. (K1’ is the equilibrium constant for the Henderson-Hasselbalch equation, Ka is the weak acid dissociation constant, and S is the solubility of CO2 in plasma.) See the image below. Approach for evaluating metabolic acidosis. Once a metabolic acidosis is suspected by low bicarbonate concentration, an arterial blood gas analysis should be obtained. The low HCO3 level can be caused either by a primary metabolic acidosis or as the metabolic compensation for a respiratory alkalosis. The direction of the pH will separate metabolic acidosis (pH < 7.35) from a respiratory alkalosis (pH > 7.45). Failure to have an appropriate respiratory response to metabolic acidosis represents a failure of airway and/or breathing, which must be addressed before any other workup commences. Once an appropriate respiratory response for a metabolic acidosis has been established, the workup for the presence of unmeasured anions can progress by using the traditional anion gap, the delta-delta approach, or the strong ion gap. This allows the differential of metabolic acidosis to be narrowed and the appropriate therapy applied. The anion gap allows for the differentiation of 2 groups of metabolic acidosis. Metabolic acidosis with a high AG is associated with the addition of endogenously or exogenously generated acids. Metabolic acidosis with a normal AG is associated with the loss of HCO3 from the kidney or GI tract, or the failure of the kidney to excrete H+. If the delta HCO3- is greater than the delta anion gap, then a concomitant non-anion gap acidosis must exist along side the anion gap acidosis. One example would be a patient with a congenital renal tubular acidosis in diabetic ketoacidosis (DKA). Stewart provides a replacement for the standard anion gap and delta/delta, which allows one to directly measure the amount of unmeasured anions in solution corrected for changes from normal of Ca2+, Mg2+, albumin, and phosphate. This is the Strong Ion Gap (SIG). All the strong ions are expressed in mEq/L, and only the ionized portions of Mg2+ and Ca2+ are considered (to convert total to ionized Mg2+, multiply by 0.7). Because of the complexity of the equation, several Internet resources are available to calculate the SIG. For example, The Stewart approach to acid-base is a good resource. The normal SIG is between 0 and 2. SIG has been shown to be better than blood lactate, pH, or injury severity scores in trauma patients and pediatric surgery patients as a predictor of mortality. Because metabolic acidosis is a condition that occurs in response to a variety of disease states, the prognosis is directly related to the underlying etiology and the ability to treat or correct that particular disorder. Hopkins E, Sharma S. Physiology, Acid Base Balance. 2018 Jan. [Medline]. [Full Text]. Brubaker RH, Meseeha M. High Anion Gap Metabolic Acidosis. 2017 Jun. [Medline]. [Full Text]. Reddy P, Mooradian AD. 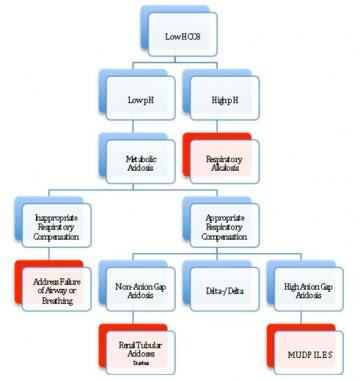 Clinical utility of anion gap in deciphering acid-base disorders. Int J Clin Pract. 2009 Oct. 63(10):1516-25. [Medline]. Stewart PA. Modern quantitative acid-base chemistry. Can J Physiol Pharmacol. 1983 Dec. 61(12):1444-61. [Medline]. Masevicius FD, Dubin A. Has Stewart approach improved our ability to diagnose acid-base disorders in critically ill patients?. World J Crit Care Med. 2015 Feb 4. 4 (1):62-70. [Medline]. [Full Text]. Raikou VD Md PhD. Metabolic acidosis status and mortality in patients on the end stage of renal disease. J Transl Int Med. 2016 Dec 1. 4 (4):170-7. [Medline]. [Full Text]. Park S, Kang E, Park S, et al. Metabolic Acidosis and Long-Term Clinical Outcomes in Kidney Transplant Recipients. J Am Soc Nephrol. 2017 Jun. 28 (6):1886-97. [Medline]. Safari S, Hashemi B, Forouzanfar MM, Shahhoseini M, Heidari M. Epidemiology and Outcome of Patients with Acute Kidney Injury in Emergency Department; a Cross-Sectional Study. Emerg (Tehran). 2018. 6 (1):e30. [Medline]. [Full Text]. Arif A, Aggarwal S. Renal Tubular Acidosis. 2018 Jan. [Medline]. [Full Text]. Manara A, Hantson P, Vanpee D, Thys F. Lactic acidosis following intentional overdose by inhalation of salmeterol and fluticasone. CJEM. 2012 Nov. 14(6):378-81. [Medline]. Gokhale YA, Vaidya MS, Mehta AD, Rathod NN. Isoniazid toxicity presenting as status epilepticus and severe metabolic acidosis. J Assoc Physicians India. 2009 Jan. 57:70-1. [Medline]. Dell'aglio DM, Perino LJ, Kazzi Z, Abramson J, Schwartz MD, Morgan BW. Acute Metformin Overdose: Examining Serum pH, Lactate Level, and Metformin Concentrations in Survivors Versus Nonsurvivors: A Systematic Review of the Literature. Ann Emerg Med. 2009 Jun 24. [Medline]. Wilson RF, Spencer AR, Tyburski JG, Dolman H, Zimmerman LH. Bicarbonate therapy in severely acidotic trauma patients increases mortality. J Trauma Acute Care Surg. 2013 Jan. 74(1):45-50; discussion 50. [Medline]. The authors and editors of Medscape Reference gratefully acknowledge the contributions of previous author, Karen L Stavile, MD, to the development and writing of this article.